Antiguan folk pottery dates back at least to the early 18th century, when slaves fashioned cooking vessels from local clay. Today, folk pottery is fashioned in a number of places around Antigua, but the center of this cottage industry is Sea View Farm Village. The clay is collected from pits located nearby, and the wares are fired in an open fire under layers of green grass in the yards of the potters' houses. Folk pottery can be purchased at outlets in the village as well as at a number of stores around the island. Buyers should be aware that Antiguan folk pottery breaks rather easily in cold environments. 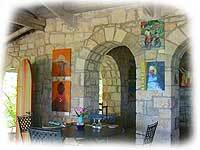 Harmony Hall, in Brown's Bay at Nonsuch Bay, is the center of the Antiguan arts community. Exhibits change throughout the year, but the annual highlights are the Antigua Artist's Exhibition and the Craft Fair, both in November. The sugar mill tower around which Harmony Hall is built has been converted to a bar and provides its patrons with one of the island's best panoramic views, including a fine prospect of Nonsuch Bay. This charming museum tells the story of Antigua and Barbuda from its geological birth through the present day. A cool oasis in the middle of St. John's, the museum contains a wide variety of fascinating objects and exhibits, ranging from a life-size replica of an Arawak dwelling to the bat of Viv Richards, one of the greatest cricket players of all time. We entertain your research enquiries.